Jonathan Daniel/Getty ImagesA good Notre Dame team creates problems for the College Football Playoff. After Notre Dame beat Stanford and Virginia Tech the last two weeks, it is looking more and more like the Fighting Irish will run the table against a favourable schedule and finish the season 12-0. 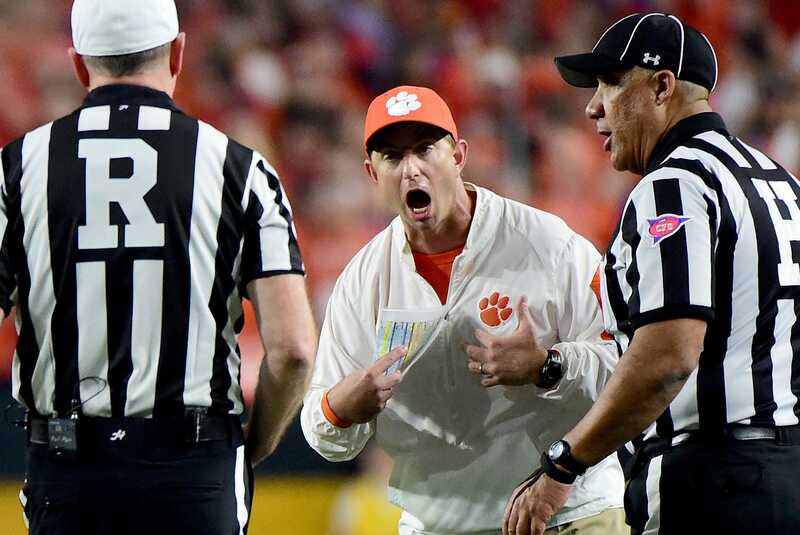 If that happens, there is a realistic chance that three Power 5 conferences will be left out College Football Playoff. 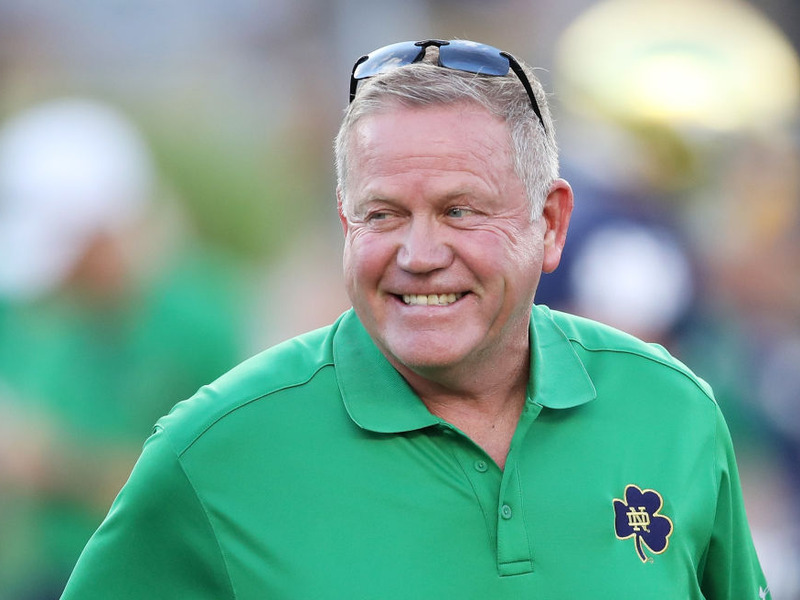 Gregory Shamus/Getty ImagesBrian Kelly and Notre Dame are in a good position. 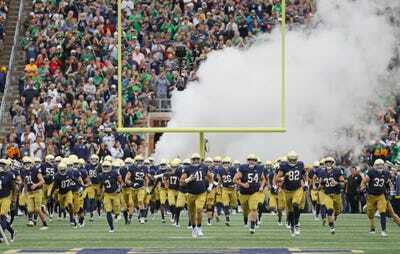 If Notre Dame goes undefeated, they are in the playoff because they are Notre Dame. Even if we leave their name out of it, ESPN’s playoff predictor gives them a 62% chance to be one of the final four. If that happens, the ACC, the Big 12, and the Pac-12 will all be locked out of the playoff this season. The best-case scenario is if the SEC runner-up is kept out – despite being one of the best four teams – and only two of those conferences are without a chair when the music stops. One argument in favour of the 4-team playoff is that we already have play-in games in the form of conference championship games. But as we have seen over and over, that is not the case. It wasn’t a play-in game for Ohio State or USC last season, and it wasn’t for Oklahoma and Penn State in 2016, or Stanford in 2015. Conference title games are also skewed to help the teams with one loss and hurt the undefeated teams. If Miami wins out and beats an undefeated Clemson in the ACC, a case could be made for the Hurricanes in some scenarios. More likely, it would just knock Clemson out. But if Notre Dame does go undefeated, they are going to be in the playoff, in part, because they don’t have to worry about soiling their record against another tough opponent. Harry How/Getty ImagesClemson could be out of the playoff even if they go undefeated. There is also a lot of money on the line. Not only does Notre Dame boost the TV ratings for the NCAA and ESPN, we also have a situation where Pac-12 teams would hurt themselves if they beat Washington. If the Huskies don’t go undefeated at this point, it would likely eliminate the conference from playoff contention and cost all the schools in the Pac-12 a share of the playoff bonus. If you want to keep Notre Dame from stealing spots and give each Power 5 conference a fair shot, the solution is simple – expand the playoff to eight teams. Of course, it is still early, and it is not strange to have this many undefeated teams at this point in the season. But what is unusual is that Notre Dame is one of them, and if they wind up running the table, it’s going to cause a new kind of chaos.